Nike is a name synonymous with sportswear. If you’re looking for the best Nike running shoes on the market, then you’re in the right place. Running shoes have been Nike’s bread and butter since its formation in 1964. The founder, Phil Knight, was a University of Oregon track athlete who sold shoes out of the back of a van at races. Nike pioneered the sponge rubber midsole and was the first of its kind to offer impact protection and cushioning. Advances in Sports Science then gave us the EVA foam in the 1970s which is an air-infused foam designed to be incredibly good at withstanding impact shock. EVA is used to this day to manufacture the midsoles of running shoes. Running shoes differ from standard shoes in a variety of ways and here are the best Nike running shoes on the market right now. If your runner’s club were a prom, then the Nike Flyknit Racer would probably be the prom queen. These extremely stylish shoes come in a plethora of colorways and they no doubt look stylish on your feet. At 160 grams for a US size 9.5, these shoes are shockingly lightweight and runners will find that the lightweight nature of these shoes does not come at the cost of reduced cushioning. The shoe is constructed of a durable Flyknit fabric for the upper and we found that the fabric was quite breathable – ideal for those hot summer months. Flywires are integrated into the fabric of the shoe and help with a snug sock-like fit when you tighten your laces. The upper did feel somewhat stiff and less stretchy compared to other shoes like the Adidas UltraBoosts. The fit was also narrow especially in the medial part of the foot. Going half a size up would help, but if your feet are quite wide, you’d have trouble regardless. These shoes are more for people with narrow to average feet. With that being said, some might find that the Flyknit Racer is on the pricey side ranging anywhere between $130-$160 (may be able to find it cheaper on Amazon). But, that is to be expected for a shoe that is constructed from premium materials. Nike engineered the Air Zoom Pegasus 35 based on feedback from elite runners and it clearly shows! As the newest iteration to the Pegasus line, Pegasus 35 features a full-length Nike Zoom Air midsole that is designed to accommodate heavy runners through a range of different types of runs. It also turns up the impact protection and offers optimum energy return with every stride. The shoes feel comfortable while also serving up the right amount of firmness and they are perhaps the best Nike running shoes for you if you’re the type that doesn’t like shoes that are either too mushy or too firm. The full-length Zoom unit is not without its flaws though and after only a month’s use, creases started to appear on the medial part of the shoe due to the constant torsion of the foot. We also found that these shoes were somewhat on the heavier side compared to other running shoes, but that is to be expected with all the features packed into this footwear. The Pentagon pattern rubber outsole provides good traction on a variety of surfaces including road, dirt, and grass. The FlyMesh construction on the upper feels better than its predecessor and coupled with the flywire lacing system, the shoes feel durable and snug. The full-length Zoom Air unit is leagues above the previous Pegasus 34 model. An immovable stitched tongue reduces rubbing against your ankles. Sizes run true and people with wider feet will love the roomy toebox although people with narrow feet might find it a bit of a loose fit. Nothing that a pair of thick socks can’t fix. + Full-length Zoom unit offers a perfect balance of cushioning and firmness. + The rubber outsole performed well on all types of surfaces. + Feels snappy and provides exceptional energy return. + Cross stitches on the FlyMesh upper kept the shoes airy and durable. – At 283 grams (10 ounces), it is slightly heavier than competitors. – After a month’s use, creases started to appear on the sides of the midsole. The Nike Zoom Fly is a durable pair of neutral running shoes. The midsole of the Zoom Fly is made from Lunarlon foam and in our experience, we found that the Lunarlons are on the softer side in comparison to running shoes that use a different midsole. Lunarlon allows the impact force exerted on your feet to be evenly distributed to reduce foot related injuries. The integrated full-length Carbon Nylon Plate enhances the responsiveness of the Zoom Fly. The shoes provide good energy return and feel natural for long-distance running. The rubber outsoles on this shoe are abrasion resistant and the grip is exceptional even on wet surfaces. Flexibility is a stand-out feature of these outsoles and it makes switching between different running positions effortless and easy. The only downside is that the treads on the outsole trapped small stones and other debris that got stuck in them while running on a dirt road. The upper is made from FlyMesh and the perforations on the upper works well to regulate the temperature of your feet. A Flywire lacing system is also standard on these shoes at this price point and they did an adequate job of holding onto our feet firmly during our runs. We did, however, find that the toe box was more roomy than what we’d normally prefer and the shoes themselves are also on the pricey side selling for about $180 on average. But hey, you get what you pay for and the return from these shoes more than justifies its price tag. + Plush and soft Lunarlon midsole made us want to run some more. + Can be worn without socks since it fits true to size without irritating the skin. – Small rocks and debris get lodged in between the treads on the outsole. – Pricey. May not fit everyone’s budget. The Nike Zoom Structure 21 is the latest iteration of the brand’s support shoes. The 21st version in the series packs some new features not found in the previous Structure 20. The Structure 21 is a shoe designed to counter the effects of overpronation. The midsoles on these shoes are made from dual-density foam. The softer Phylon foam helps with cushioning while the harder foam delivers support. This helps in spreading the forces acting on your feet evenly, resulting in a dynamic and responsive stride. The midsole also has a “crash pad” that helps absorb impact and Nike really did their homework to make the Structure 21 ideal for half or even full marathons. The Flymesh upper uses a mono-filament thread which helps to reduce weight while maintaining its structural integrity and thereby making the 21 lighter and sturdier than its predecessor. Ventilation on the upper material is excellent and you won’t face any heating issues for longer runs. One thing to note is that the forefoot part of this shoe has a softer feel to it compared to the firmer heel area. The outsole of the Structure 21 is made of Duralon rubber in the forefoot and contains tiny air pockets that give this shoe the softer “bouncy” feel. The rest of the outsole is covered in hard carbon rubber to aid with traction and durability. The transition from heel to toe on these shoes is effortless and it’s designed to help propel you forward in a run. Also helping that rocket-like propulsion is the 10mm heel to toe drop. These shoes are ideal for runners with moderate flat-feet although it does lack padding in the heel area. + Great stability shoe ideal for runners with flat-feet. + Plenty of cushioning in the forefoot region. + Good support and stability with excellent impact absorption. – Lack of padding in the heel may not sit well with some runners. – The fabric around the ankle caused some irritation when worn without socks. The LunarStelos are a great pair of neutral running shoes for beginners and seasoned runners alike. They are also one of the most value-packed affordable shoes on the market right now. The thick midsole is constructed of dual-density foam with the softer part sitting on top of the harder foam. It has a 10mm heel to toe drop and in our testing, we found that in terms of comfort, the midsole sits right in the middle of comparable running shoes. If you’re used to the plush feel of the Nike Zoom Fly midsole units, you may find this to be on the stiffer side. The outsole features Nike’s signature laser-cut rubber pattern with wave-like grooves that offers exceptional flexibility and grip. Hard rubber pieces mark the heel and tip of the outsole to provide extra durability. The shoes did feel a bit tight around the medial foot in our testing but settled after a brief break-in period. The real champion here is the upper on these shoes. The upper mesh is extremely breathable with added ventilation through perforations on the sides. A Flywire lacing system holds everything in place and it’s nice to see such quality construction on an affordable pair of shoes usually only reserved for the more expensive Nikes. If you’re looking for value-packed Nike running shoes, you can’t go wrong with the LunarStelos. – Midsole feels stiff compared to the more expensive Nike runners. Nike’s newest Flex Fury 2 improves on many aspects of the previous gen Flex Fury. At 221 grams (7.8 oz), this new version is more lightweight than its predecessor. They are the best Nike running shoes for those on a budget. There is also a new double mesh upper that maximizes airflow while remaining more durable and flexible. Also making an appearance is the Flywire cable system that allows for a more seamless and snug fit. Nike’s signature dual-density midsole offers excellent cushioning for all types of runs. The smooth fabric lining on the interior is adequately padding and adds to the shoe’s comfort factor. The outsole consists of reinforced rubber hexagonal treads capable of tackling all kinds of terrains. We did, however, find that the shoe was a bit tight around the arch and it required a day or so to break them in. If you have particularly wide feet, it’s advisable to go half a size up. Also, not a favorite was the lack of padding on the tongue. It just felt unnatural against the skin especially since I like to wear no-show socks while running. – Tongue is very thin and feels unnatural. The Free RN are Nike’s premier line of neutral running shoes and for this year’s 2018 model, Nike has updated the shoes with an all-new circular-knit spandex upper for a snug and flexible coverage. A completely redesigned heel is also a standout feature and Nike likes to call this the “Dynamic Heel Fit System” which consists of flywire cables that loop around the shoelace and an elastic strap that stretches to hug the heel and provide a more secure fit. Unfortunately, we found this to cause some discomfort as it rubbed against the ankle while running. If you wear socks that are high enough, this shouldn’t be an issue. The Nike Free RN also incorporates safety features like reflective strips along the heel, tongue, and sides for night-time running. The midsoles are made from co-molded dual-density foam. At its core is the Phylon foam that is lightweight and designed to offer responsive cushioning. The second bit is a denser EVA foam and its purpose is to provide stability and durability. The outsole consists of treads in tri-star pattern for added flexibility and while we can’t help but admire just how bendy the outsoles are, it comes at a cost in the form of reduced traction – especially on wet surfaces. + Good balance of comfort, cushioning and support. At around $120, the Nike Odyssey React is the cheaper version of the more expensive Epic React. Nike had to cut some corners to make the Odyssey cheaper. For example, the Odyssey uses a cheaper mesh upper instead of the traditional Flyknit fabric. This makes the Odyssey’s upper less breathable compared to Nike’s flagships. It is also stiffer than the Flyknit and doesn’t conform to the shape of your feet as well as the Flyknit. A thick neoprene tongue adds to the breathability issue causing sweaty feet, especially during afternoon runs. On the plus side, the Odyssey does have a plush sock-liner not found in the Epic React. But, the real winner in these shoes is the premium midsole that remains the same as the more expensive Epic. Furthermore, sizes do run a bit small and it’s recommended to go half a size up for those with wide feet. 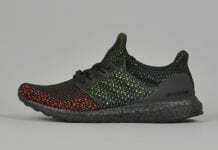 Another point of contention is the not-so-durable outsole that has reinforced rubber strips on near the toes and the heel area. The rest of the mid-portion is just the exposed midsole unit. Due to this, we cannot recommend using these shoes for any terrain except on the road. – Firm upper which reduces flexibility. Heel-to-Toe Drop: Unlike workout shoes, running shoes have a large heel-to-toe drop of between 8mm to 14mm. The heel-to-toe drop is the height difference between the forefoot and the heel. This is important in running shoes since a greater slant helps with forward propulsion. Shoes with a larger heel-to-toe drop are ideal for every day and long-distance running while shoes with lower heel-to-toe drop are great for race days. Cushioned Midsole: Midsoles in running shoes are often spongy and soft. Due to the number of forces acting on your feet while running, the midsoles on these shoes are heavily padded and offer superior cushioning compared to any other type of shoe on the market. The midsole is usually manufactured from EVA foam, but companies like Nike have proprietary technology packed in the midsole like dual-density and Lunarlon foams. Lateral Support: Running shoes are meant purely for forward momentum and thus, lack any sort of support for lateral movements. It is highly advisable not to use running shoes for workouts at the gym since you run the risk of injuries while weightlifting etc. They also wear out quickly if used for anything other than running/walking. 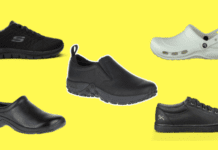 Some running shoes offer arch support for people with flat-feet. Mesh Upper: Running can be a difficult activity especially during the hot summer months. Due to this, Nike uses a breathable mesh material to construct their uppers. Unless you’re mostly running on a treadmill in an airconditioned room, the breathability factor should be high on your list of considerations. Rubber Outsole: Importance should be given to the type of terrain you’d be running on. Some running shoes are only meant for the roads, while others can perform in dirt, grass or trail. Trail running shoes usually have hard reinforced rubber pieces on the outsole to increase durability and grip. Running, by nature, is a potent and rewarding workout if done with the proper tools. No other tool is more essential in running than a good pair of shoes. Longtime runners usually have two or more pairs of shoes – one pair that has good cushioning and thick midsoles for everyday running, and another pair that is lightweight with a low heel-to-drop ratio for race days. While our list might not be able to satisfy everyone’s needs, it should hopefully work for most runners out there that are looking for Nike running shoes in particular. Running shoes can also double as a lifestyle product and some like the Nike Free RN 2018 go well with streetwear. At the end of the day, you don’t necessarily need the most expensive pair of running shoes to have an enjoyable workout. But, if you’re looking for the added features and don’t mind shelling out the extra cash, then it makes perfect sense. Features like the Flywire system and double mesh upper might increase comfort and fit, but they’re not really necessary if all you’re looking for only basic running shoes. Have fun and go run!